Trumpeter Brian Groder’s trio consists of bassist Michael Bisio, and drummer Jay Rosen. They play a stylish brand of modern jazz that builds upon the freedom of improvisational jazz, yet with a clear focus that is still accessible. Their second offering R Train on the D Line is an extension of where they left off with their 2014 release Reflexology. The Opener “Quanta” is fast and furious, and you are immediately taken by the clean intensive sound of trumpet. The lines between composed and the improvised lines seamless blur, seguing seamlessly between rhythmic figures. This same precision and restrain is a signature sound for Groder. The same syncopated melody line can be found on “Retooled Logic,” which also kicks off with a syncopated melody line and wide intervallic leaps. The trumpet and drums dynamically drop out, leaving Bisio to improvise a poignant arco passage. What is magical is even in these introspective moments, the pulse and forward motion never disappears, it is implied long after the rhythms of Rosen cease. Spaces are what create some of the most memorable moments in music, almost like a fine Hitchcock movie, its what Is not being said, yet implied that allows the listener to take flight. Another tune the ensemble shines on is the caressing ballad “Whispers,” the tenderness and beauty of the trio really shines through. Groder’s continues to build his discography in a thoughtful, meaningful approach. He chooses his collaborators well. Noted moments include his collaboration with Sam Rivers, Doug Mathews, and Anthony Cole in 2006 on Torque as well as his 2009 collaboration with pianist Burton Greene, Groder & Greene. Both of the albums are full of dynamism and precision, the same consistency that is found in Groder’s playing also here on R Train on the D Line. A recommended Listen. 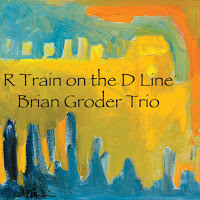 Be the first to comment on "Brian Groder Trio | R Train on the D Line a New York Inspired Journey"